If you've read my blog for as long as I've been posting here (anyone?) than you will know I have always wanted to be an author. In fact, I've "published" a few of my short stories and poems on my blog. But. But I've never finished anything. Ever. So of course now that I have a baby, a vlogging channel, a husband, and several autoimmune diseases, I decided to do NaNoWriMo 2016 when a friend mentioned she was doing it. Because its still the number one desire in my heart, but it feels insurmountable. 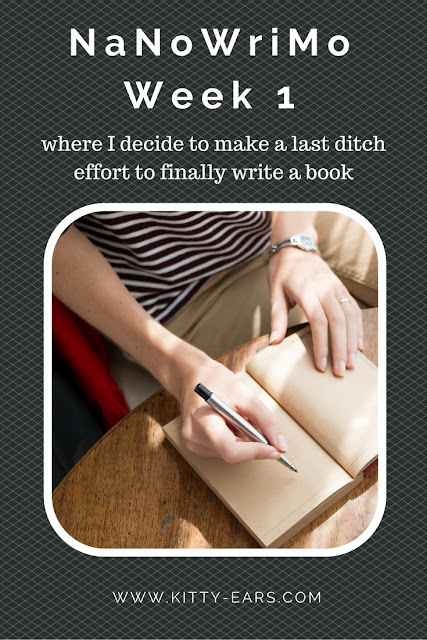 I couldn't write a book before I had a baby and a husband; so what makes me think I can now? But it is my dream, guys, to write a book. My LIFELONG dream. And I haven't written a single story since 2014, when the one I was trying to write started to annoy me and I decided it was horrible and The Worst Story ever written and I subsequently gave up. I've given myself a goal of 2,000 words a day: I only need 1,700(ish) a day to make it to 50,000 by December 1st, but I want to make sure that if I happen to lose a day (because I have a toddler) I don't fall behind. I was so scared when November 1st rolled in. Would I write anything? What would I write? What if it is horrible? What if NO ONE LIKES IT? Clearly, I have great motives, guys. Well, I am proud to say I have written 10,500 words as of today (the total for this week). My story is not perfect and I am sure that come December it will need a LOT of editing. But I am heaven bent on finishing something so that I don't have this "I never finished anything" THING hanging over my head for the rest of my life. So on my death bed when I go to meet Jesus I can die with one less regret. I'm going to write a book, you guys. This is officially my last ditch effort. Send prayers. And chocolate.